Quickly access technical support and resources for your practice. To help you and your staff use our electronic health and medical record software, we have many varieties of media and communication channels to support your usage of PrognoCIS EHR and the other medical hardware and software works alongside to keep your practice productive. 96% of PrognoCIS Providers reported being satisfied with how simple Bizmatics made it to handle their issue & with the overall quality of the support service. 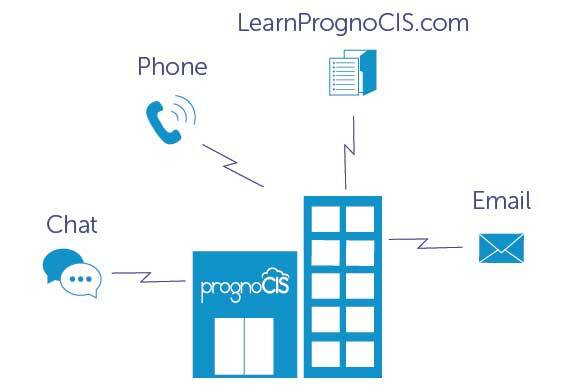 When logged into PrognoCIS, an online Resource Center with training tools such as User Quick Guides, FAQs, and videos is easily be accessed by clicking on the Resource Center icon in the software’s top navigation bar. Feel free to download this support guide for an additional desktop reference for the simple steps to generate a support case through the Resource Center. For PrognoCIS members who require additional assistance beyond using our Resource Center, we offer unlimited aid from our Support Team. Our team includes healthcare domain experts and technology specialists. Each member is equipped with the tools to meet both simple and complex challenges, from helping users set their software up for the required Meaningful Use elements to adding a new provider to the EHR. The best way to contact the Support Team is to use the Resource Center to submit your questions or check on the status of an existing case. They can be reached by phone, online chat or email. © 2019 Bizmatics, Inc. All rights reserved.